In our last post we mentioned that we’re celebrating the centenary of Ladybird books, and we noted our BBC Breakfast appearance and upcoming lecture with Lawrence Zeegan. Our Ladybird material will also make appearances at a number of exhibitions around the country – starting right here in Reading at Reading Museum’s current exhibition: Allen Seaby: Art and Nature, which runs until 22 March. 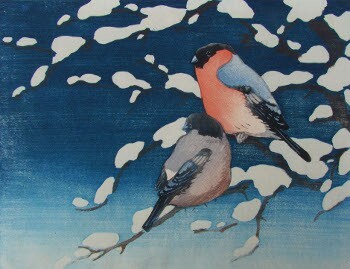 Seaby (1867–1953) was an illustrator, teacher and novelist well known for his bird and animal paintings as well as his role in incorporating Japanese woodblock techniques; he was also a Professor of Fine Art at the University of Reading. The exhibition features a number of books from our Children’s Collection illustrated by Seaby as well as a series of the artwork he did for Ladybird, including the Ladybird book British Birds and Their Nests. A beautifully illustrated book – Allen W. Seaby – Art and Nature by Martin Andrews and Robert Gillmor – has been published by Two Rivers Press to accompany the exhibition. This Saturday (17 January), Reading Museum’s annual Friends Lecture will focus on Seaby. Martin Andrews, printing historian, artist and author (as well as a Special Collections regular), will discuss the life and work of Seaby. The event will include a seated lecture, refreshments and a demonstration of printing from woodblocks in the Japanese style. It runs from 2–3pm and can be booked by emailing the Secretary of the Friends.